Another fine if freezing day, this time in Paris, after which I feel fully arted, very pogged, and once more chilled to the marrow. 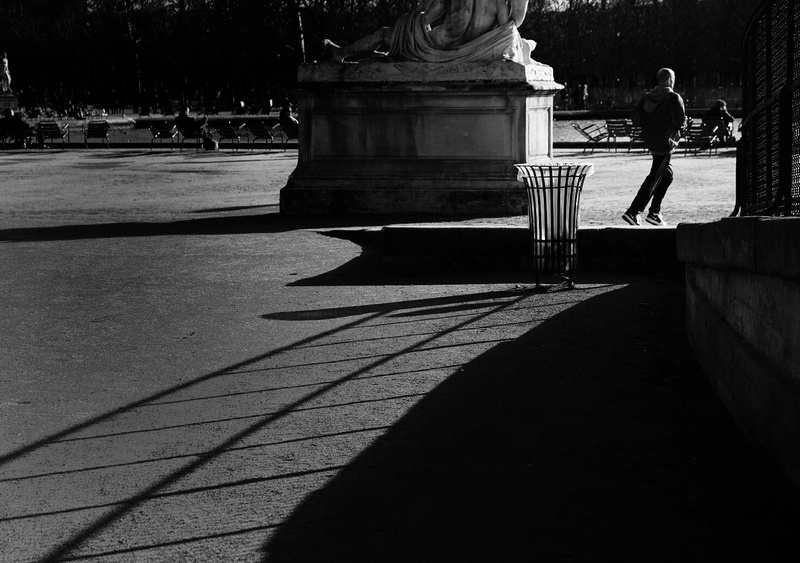 I spent the morning at the Winogrand show, the afternoon at the Muse D’Orsay, the evening stuffing my face, and the interstices taking photographs such as that above, in and around the Tuileries. I’ll come back to the Winogrand in a later post, after I have digested my thoughts on it (and hopefully before I have forgotten them all – this presents a window of around 49 minutes sometime tomorrow afternoon). But safe to say I am conflicted on it. No conflict whatsoever on the Musee d’Orsay. It has long been in my top 5 galleries in the world, along with Moma (NYC), the Reina Sofia and Thyssen (Madrid), and the Courtald (London). But this trip it moved to the head of the pack for me. The ostensible glory of the place, as for Moma, is the impressionist gallery, which maintains a more or less chronological path from the 1860s to the 1890s. But while Moma’s collection is large, the Musee d’Orsay’s is gargantuan and as I wandered through it again, the sheer scale of it all was overwhelming. In a place with at least 50 Renoirs and as many Manets, you find yourself giving about 30 seconds to each – about the same as for a Winogrand shot as it happens, despite their vastly different places in the run of art history. Notwithstanding crown jewels such as the stunning originals of Manet’s Le Déjeuner sur l’herbe, and Renoir’s Bal de Moulin de la Galette, I felt myself longing for the compactness and eclecticism of the Courtald – a miniature jewel box of rare quality that keeps your attention wherever you turn. Brimfull of hazy belle epoque imagery I was about to head for the exit, when I chanced on a temporary showing of the recent acquisitions of the gallery, tucked away on the 5th floor. This exhibition is worth a visit to Paris just by itself. Since 2008, the Musee alone has acquired over 4000 pieces, and this display of absolute confidence in their own taste and funding speaks volumes about France’s place at the pinnacle of the art world. Rather like the Courtald, the show mixes genres, styles and techniques, from furniture and tapestry, to photographs and paintings. They are all united by being rooted in the 19th century, and unlike the Impressionist gallery’s relentless focus on Parisian artists, this draws on English German and Italian work as well as French. It’s all gorgeous, and contains some truly stunning furniture, including the single most beautiful chair I have ever seen. You can read a rather plonking description of it here, but take my word for it, it’s far better than they describe, and in my view a must-see. A final aside. Years and years ago, the French Maigret detective series was shown on the BBC. Maigret was frequently summoned to the Government offices at 36 Quai d’Orsay, just down from the station which later became the Musee. Arty graffiti of the time started to appear in London saying ‘Maigret rules – au Qai? Oh how we roared. Happy days! Still on the subject of les flicks, I didn’t see one on the street my whole trip, despite the promise of massive police and army presence following Charlie Hebdo. Perhaps it was because it was Saturday, and as any fule kno, terrorists, like many restaurants in Paris, don’t bestir themselves on Saturday.